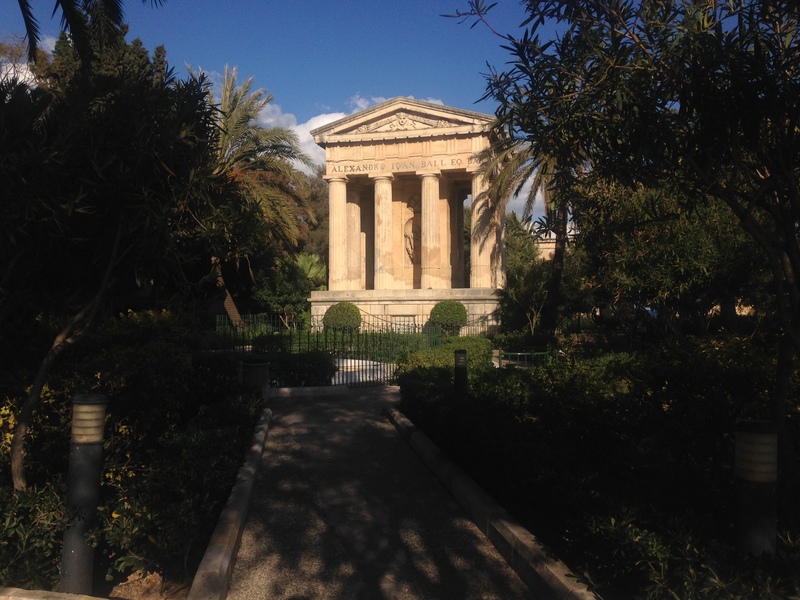 Desperate to escape Lyon’s unrelenting damp and grey, I took advantage of the university break this past week and fled to Malta, a tiny Mediterranean country made up of three islands south of Sicily. January/February is the off-est of seasons for Malta. Visiting felt a little bit like walking in on somebody half-naked in a fitting room, because everything was under construction. Still, I felt like I got more sun in one week in Malta than in the last few months in Lyon, and my eyes gobbled up the bright blues, yellows, and greens of the landscape. I criss-crossed the islands on foot and by bus, gritting my teeth as the latter somehow managed to navigate two-way streets barely wide enough for vehicles but also full of children, elderly people carrying heavy objects, and stray dogs with a death wish. Malta is a place of after-images, superimposed. Between 5000 BC and 1964 Malta’s rule changed hands many times, and each hand left its distinct mark: the archipelago is littered with temples, fortifications, bombing damage, and British red phone booths, its Semitic language is littered with Italian and French idiosyncrasies (while most people also speak English), and its residents drive on the left, worship in Catholic churches, and paint the bows of their traditional fishing boats with the Phoenician eye. It’s a functional mess. 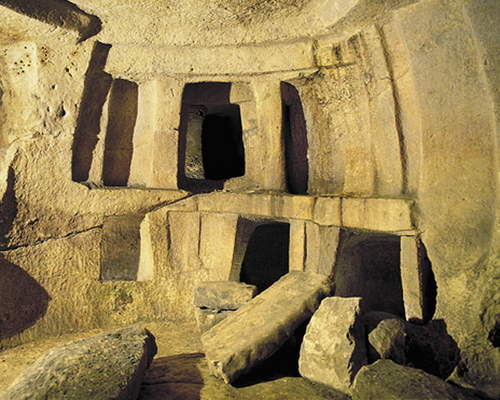 The Hypogeum of Hal Saflieni in Paola. Buried under a row of houses in a suburb of Malta is a multi-level, multi-chambered mass tomb hewn in stone and swirling with ochre paintings. It’s a bit expensive to take the tour (30 euros), but how often do you get to stand inside an almost-5000-year old man-made structure and think about how short our human lives are? St. John’s Co-Cathedral in Valletta. 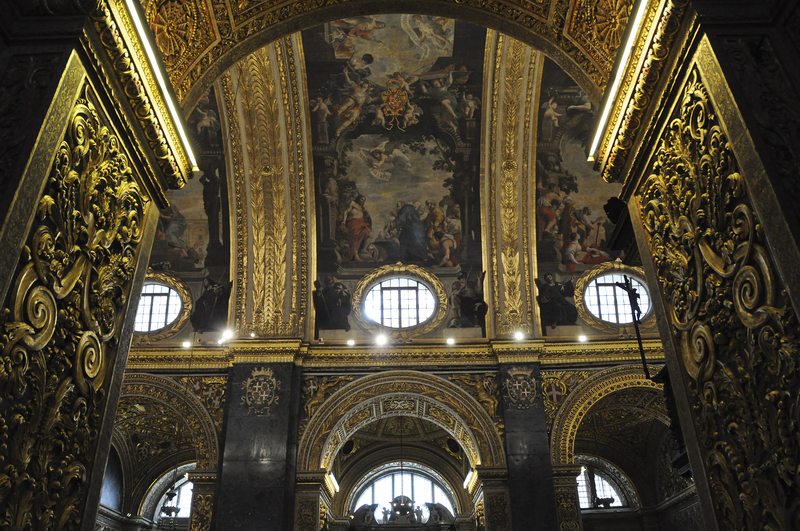 Even heathens like me can be dazzled by the inside of this place, which looks like angels puked gold all over it. From the ornate ceilings and walls to the mosaic tombstones on the floor, there’s not a bit of empty space. Also, for art history nerds like me: they have two Caravaggios. Barrakka Gardens in Valletta. Two sets of gardens along the city walls have been filled with fountains, plants, and benches to give you a peaceful view of sea and city. 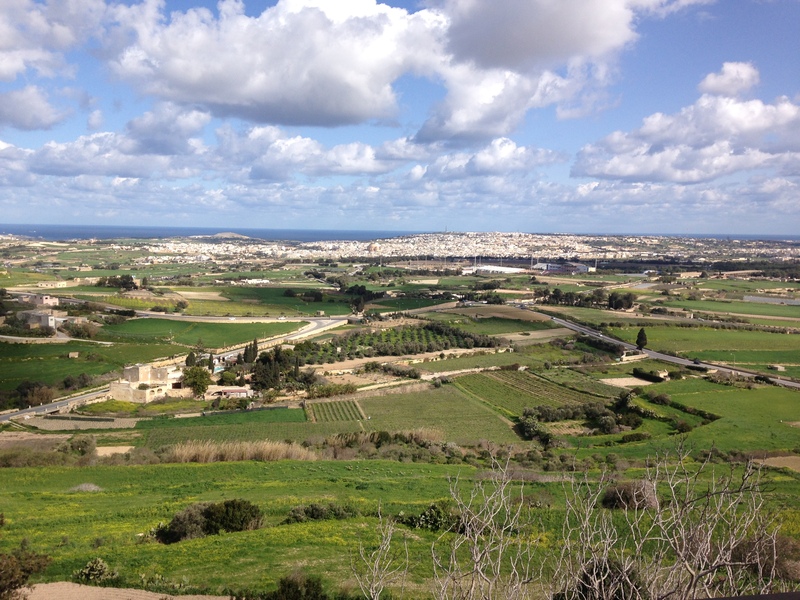 Coffee break atop the walled city of Mdina. The narrow pedestrian streets of this beautiful city are maze-like and spotless. Several cafés have set up shop along the top of the walls, including Fontanella Tea Garden, a relaxing place to have a bite or sip and gaze at the ocean far below. Meandering on Gozo. Small enough to walk across and around (an activity that is also all but necessary this time of year, as buses are infrequent), this island is hilly and sparsely populated, and the only buildings of any height are massive domed churches and citadels. 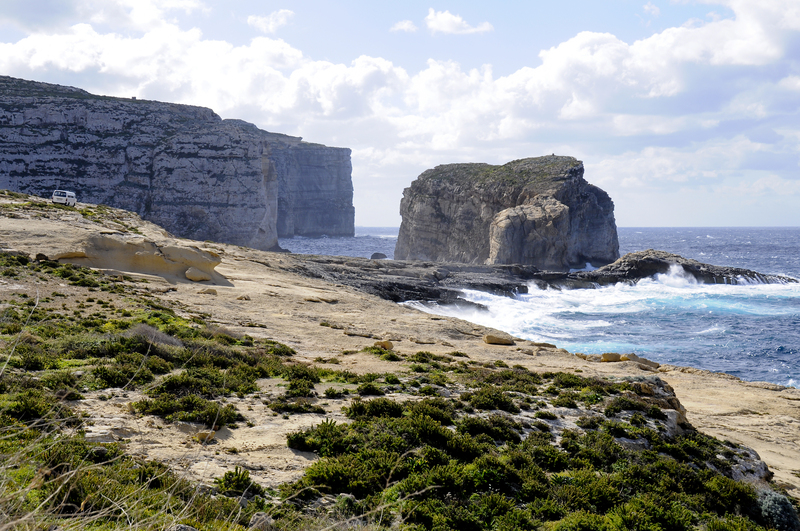 This feature of the landscape, along with the shepherds driving sheep, old men hanging out with their dogs, and the dubiously-paved roads that run through abandoned industrial areas and peter out into gorgeous sparkling bays of clear water, make walking Gozo a bizarre adventure of many twists and turns. Two of the prettiest sights were the cliffs at Dwerja (first photo of this post), and the Azure Window (image below). Mint Café in Sliema. The New Zealanders who run this café stock the display case with more tasty-looking meals and sweets than I’ve ever seen in one place. 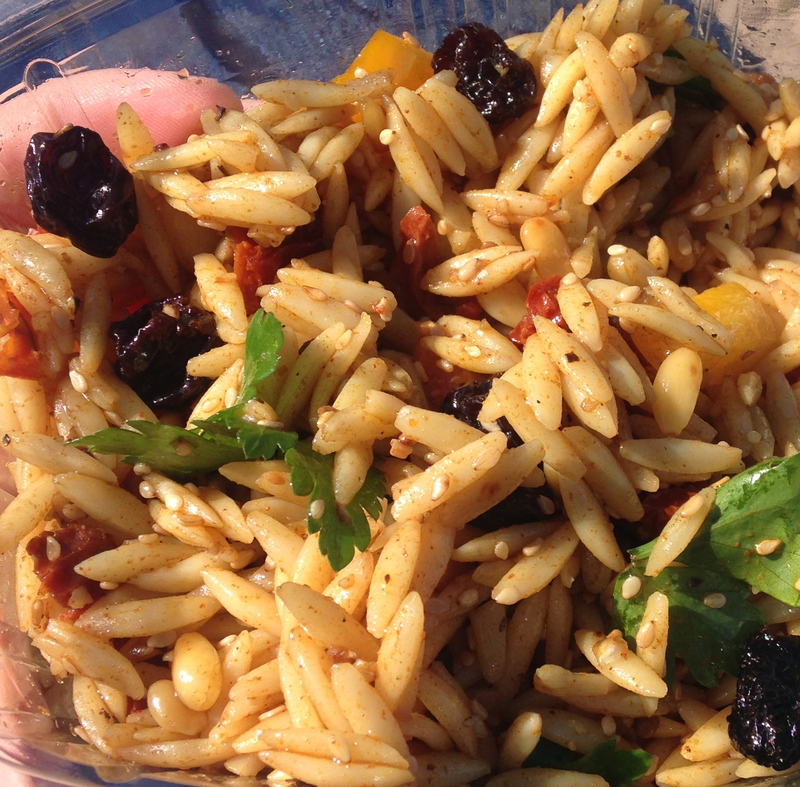 I stuffed my face with some of their tasty vegetarian salads, as well as a slice of their banoffee pie washed down with strong, smooth coffee that was all richness and no bite. Maybe not the most authentically Maltese experience, but it was love at first sight. Travel time: From Marseille, about a two-hour flight. The ferry between Malta and Gozo takes twenty minutes. Total: about 390 for the whole trip – off-season prices combined with avoidance of most of the paid tourist attractions can help keep costs down. Further skimping on food and lodging could bring this target budget down further.